LAKE TAHOE, CA--(Marketwired - Nov 8, 2013) - Earlier this week, the travel experts from VirtualTahoe.com, an authority travel & tourism website in Lake Tahoe, announced their top 5 money saving lodging picks in South Lake Tahoe this winter 2013 - 2014. In making their selections, the editors from VirtualTahoe considered a variety of criteria but focused primarily on who was offering the most overall value regardless of price. Selecting a hotel, motel, casino resort, full service resort, cabin rental, or vacation rental home can be a challenge to an outsider in a sea of unfamiliar options and packaged offers -- which is why VirtualTahoe created this 2013 - 2014 winter guide to saving money on lodging in South Lake Tahoe. 1. South Lake Tahoe Hotel / Motel - 3 Peaks Resort and Beach Club: The 3 Peaks makes the list for several reasons... First, they offer three different room types (Tahoe-styled motel rooms, 1,2,3 bedroom suites and a 5-bedroom cabin rental that be split), Second, guests can walk to the 3 Peaks' private beach, the Heavenly Gondola, the casinos at Stateline, and any number of popular restaurants. Third, rooms include marble countertops & upgraded linens, there's an outdoor hot tub (nice after skiing or riding), and guests enjoy free parking & wireless Internet without having to negotiate for it. Forth, the 3 Peaks is pet friendly for those looking to bring along a furry friend and offer plenty of grounds to walk the furry friend. And lastly, when comparing their room rates against other comparable hotels within one mile, they offered the lowest price on a 1, 2 or 3 night stay more than 80% of the time on a random sampling of dates less than 45-days in the future. Best Feature -- Rates starting at $39/night. 2. South Tahoe Casino Resort - Horizon Casino Resort: The Horizon was recognized for several reasons. First, their room rates are always low with no-frills suites that can fit more than 6 people. Low rates and lots of room translates to high value for skiers & boarders interested in the slopes by day and entertainment by night. Second, the amenities are unique as they offer eight movie screens which is perfect for families and the Horizon dining options range from a buffet to the Four Seasons' restaurant with a menu broad enough to satisfy anyone with an appetite. Last, they are centrally located next to the other casino hotel resorts with easy access to Lake Tahoe and the Heavenly Gondola. Best Feature -- Consistently low room rates appeal to people looking to save a few bucks and still be in the center of all the non-stop downtown South Shore action. 3. South Lake Tahoe Resort (Full Service) - Ridge Tahoe Resort: The Ridge got the nod for three primary reasons. First they are now offering a 30% off promotion for lodging stays between January 5, 2014 and April 12, 2014. Thirty percent is real money. Second, like the name hints, the Ridge sits high above South Shore offering guests breathtaking views of Lake Tahoe that are as awesome on the first day of a stay as they are on the last. Last, it's a full service resort that's really only a short 5-10 minutes drive into South Shore where guests can enjoy world-class entertainment, restaurants and access to the Lake. Best Feature -- Views are breathtaking and priceless. 4. 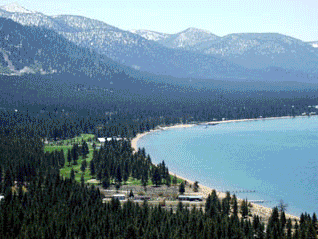 South Tahoe Cabin Rentals - Camp Richardson Historic Resort & Marina. Camp Rich is Tahoe is all its glory. Families love it, couples love it and the VirtualTahoe editors loved their Annual White Sale offering guests 50% off midweek stays 5-nights or more. Combine that with unbeatable amenities including an on site marina, the Beacon Bar & Grill, general store, coffee and ice cream parlor (they may have made the list just because of this) and the Mountain Sports Center where guests can rental winter cross-country and snowshoe gear, make Camp Rich a runaway selection. Best Feature -- the ice cream parlor (and everything else). 5. South Lake Tahoe Vacation Rentals - Tahoe Keys Resort & Lake Tahoe Vacation Guide. The editor's pick in this category because of several distinct features. First, they offer a diverse selection of more than 260 vacation rental lodging options in South Lake Tahoe ranging from world-class lodging at the Tahoe Keys Resort (some on the water), mountain cabins, condos, homes, and group lodging. Second -- reputation, reputation and reputation. They've been at this for decades and research revealed high ratings and consistent positive guest feedback. Third, they are currently offering a minimum of 25% off select rentals and offer other special deals throughout the year. Best Feature -- Tahoe Keys vacation rental units on the water. "There are so many great places to stay in South Lake Tahoe it really is hard to pick one of the next," said Lindsey Skinner, editor at VirtualTahoe.com. "But once we decided that overall value was the criteria, these picks rose to the top. Visitors to South Shore are looking for value, not just the lowest rate. Some people define value as a low rate, but many are looking for the full vacation experience at a fair and reasonable price based upon their individual tastes and financial means." It's already snowed in Lake Tahoe so the industry is looking forward to an early start to what many are forecasting to be a long and white ski & riding season. For more information on vacation lodging options of all types in South Lake Tahoe visit http://www.virtualtahoe.com/Pillows/index.html.